Our SCOFF group meet fortnightly and this is led by Mr Azad, our Cooking Nutrition Teacher. 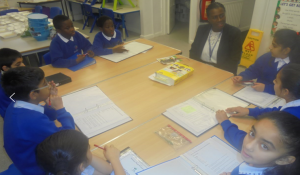 Our Kitchen Manager Mrs Simpson also attends some meetings. Meetings take place in our state of the art kitchen. One child from each class in KS2 represents their class and puts forward opinions, suggestions, points of view and feedbacks to the other SCOFF members. Each SCOFF member has an allocated role and these are altered termly to ensure the children have the opportunity to be responsible for different areas. How the school dinners could be improved? The effectiveness of lunchtime monitors? Food wastage at dinner times and how this can be tackled? What the different classes would like to cook or bake in the Cooking and Nutrition lessons? If you have any suggestions and ideas for the future meetings, please do let your SCOFF representative know.